Today's busy watering hole/restaurant, Old City Hall, 814 Saginaw Street, was the scene of the gruesome story of the death of Canada Em, a prostitute named Emmaline from Toronto. Incarcerated in a cell in the basement in the 1880s, she suffers catatonic fit and is mistakenly buried by police. Her boyfriend, known only as Bay City Bart, arrives back in town, digs her up and finds she has been buried alive, a fact revealed through horrible scratchings on the inside of her casket made by her fingernails in a desperate attempt to escape entombment. Jail cells are still in the basement of Old City Hall but now are used for storage. Canada Em may still be around, according to employees. She haunts the building, leaving lumps of coal on table 14, flushing toilets, slamming doors, spooking waitresses in the basement where she died over a century ago. In 1925 world-famed animal trainer and vaudeville star Dolores Vallecita was killed in this same building by one of her favorite Indian leopards. The building, owned by local entrepreneur John Meagher, was vacant at the time it was rented by Ms. Vallecita as a place to train her performing beasts. 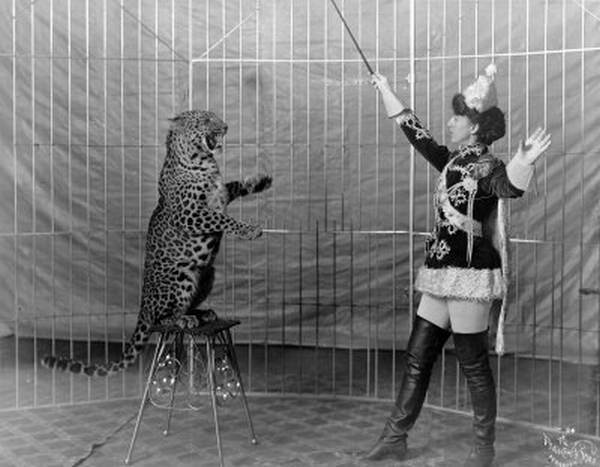 As the beauteous circus star turned to one of six leopards her favorite jumped at her, his paws encircling her neck, a long razor-sharp claw severing her windpipe. An affectionate embrace was accidentally fatal. Blood gathered in her lungs and it was impossible for doctors to save her. All theaters in town closed for her funeral and she was buried in Elm Lawn Cemetery where historians only recently discovered her grave site, listed under the name Dolly V. Hill. The arrest in 1932 of two members of the Bonnie & Clyde gang, Ray Hamilton and Jean O'Darr, at an upstairs roller skating rink on Bay City's Water Street, also known as Hell's Half Mile, eventually led to the last execution in Michigan history. Hamilton and O'Darr were thugs sent here by Bonnie & Clyde to rob the bank in Midland which received a bi-weekly $75,000 Dow Chemical payroll via train from Detroit. The pair was returned to Texas by the Texas Rangers and sent to prison. Bonnie & Clyde attacked the prison, killed a guard and broke them out, launching the final infamous crime spree that ended with their death in a police ambush in Gibsland, Louisiana May 23, 1934. Alarmed Midland merchants formed an armed vigilante group when they heard of the Bay City arrests and realized that criminals nationwide were targeting the periodically cash-flush bank. Five years later two Hamtramck bandits, Anthony Chebatoris and Jack Gracey, were shot by a sharpshooting dentist, Dr. Frank Hardy, as they left the bank after a failed robbery. Dr. Hardy, one of the Midland vigilantes on guard against robbery, had his office upstairs above the bank. He was believed to have been one of many townsfolk armed and ready for bandits. Hearing a commotion on the street, the alert Dr. Hardy poked his deer rifle through a screen and fired at the criminal duo fleeing after a botched robbery. The thugs had plugged two bank employees and a uniformed driver from a Bay City firm but didn't get a dime. Gracey died instantly from a head shot by Dr. Hardy and Chebatoris was wounded in the arm. In a wild chase in downtown Midland, Chebatoris was dragged from a commandeered vehicle and jailed in Saginaw. Taken in chains daily for trial to the Federal Building in Bay City, he was tried before the so-called "hanging judge," Arthur Tuttle. The Hamtramck bandit, who espoused Communist and other anti-social philosophy, became the 13th execution in Michigan history on 8 July 1938 in Milan Federal Penitentiary. The arrests of the Bonnie and Clyde Gang members on Hell's Half Mile in 1932 and the sentencing of Anthony Chebatoris to die from the Federal Court on nearby Washington Avenue have given Bay City ghostly tales few otherwise sleepy towns can match. There were visits here from other well-known criminals. Notorious Pretty Boy Floyd stopped here twice in the 1930s, not on social calls. He held up a gas station and kidnapped two men and was rousted at State Park by Ranger Alton Conklin. Luckily for Officer Conklin this was before Pretty Boy's spree of 10 killings that led to his shooting by Ohio police.